The test winner with perfect cleaning results! 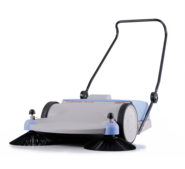 The Kränzle hand power sweepers are the absolute test winners at the ETM test and impress with their extremely efficient dirt holding capacity. Regardless of whether it is a 2 + 2 with double-roller hasp principle or a Kränzle 1 + 1 with dustpan principle, either model is characterized by its well thought-out functional details. 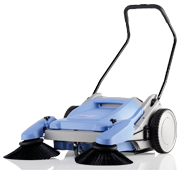 The counter-rotating side brushes of the Kränzle 2 + 2 virtually sweep the dirt into the 40 l large storage bin. Time for the big clearout. With the Kränzle test winners. 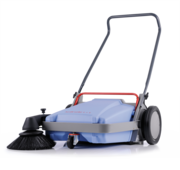 Both Kränzle power sweepers are characterized by their efficient dirt pick-up which is brought to perfection on the Model 2 + 2 machine with its counter-rotating side brushes. Storage bin and housing are made of impact-proof plastic and therefore robust and durable. The side brushes are height adjustable and can therefore be perfectly adjusted to different ground conditions. To save space and relieve pressure on the brush heads, fold in the pushbar and place the machine vertically on the joint covers and tank frame.